– Alexander Wang is offering up to 40% off select spring and resort styles this week! There are so many pieces I am coveting, it’s hard to share just a few with you! BUT, I’ll do my best. Let’s start with accessories: this sleek grey + silver crossbody bag is just the item I need for fall in London. Remember this clutch from an outfit post a few months ago? Yep, it’s on sale too (also love this all-black version for a simpler style). If you’re a fan of color, check out this purple pair and this pink pair of pumps. So cute! On the clothing side of things, you MUST check out this zip-front blazer, this easy striped tee, and this peplum-pleated top! Just enter code VIPSALE2015 at checkout to save. – Take 25% off your order at J.Crew when you enter code SUMMERLOVE at checkout! Some current J.Crew faves of mine include this simple silk top (perfect for the office! ), this floral print bikini, these stunning gold sandals, and this little white eyelet dress. PS – don’t forget to take a peek at their cute cover-ups for your next beach vacay! – Last but not least, you’ve gotta visit Shopbop’s sale shop. They’ve marked down hundreds of new spring items in the last week! The ones on my list? This chic one-shoulder top, my favorite faux-leather jacket (in a new color! ), this romantic vacation-ready dress, and this pair of white denim. Don’t miss these and more! Click here to shop it now. great picks! loving this pink jacket. I love the feminine chic vibe of this! ok, that sofa! Need it in my house but can’t have it bc my pups try to eat my couch pillows. Great edits as always. I love those tassled loafers and that classic Givenchy satchel. Beautiful picks! 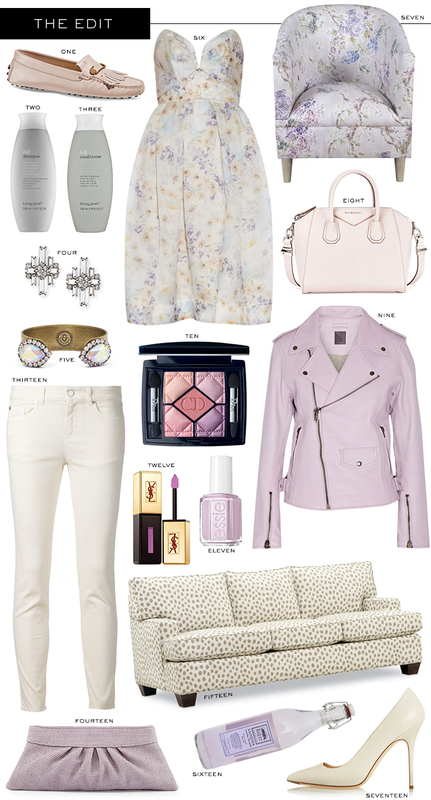 I’m so mad at myself for not getting a peach perforated leather Rebecca Minkoff leather jacket last week! This lavender one is amazing too! Ok that lavender jacket is just too good! Great finds, Merritt! #’s 1, 6, 8 and 4 are my favs!!! Great picks and palette as always! Nice sofa! Thanks for the sale notices. J.Crew haves pieces I want. Great picks – love the colors! The Givenchy bag is so perfect! !